Broadcasting of what is going on at your desktop through the webcam is a very popular trend now. You can stream presentations, application tutorials and bug reports, you can broadcast movies or share your web surfing experience. And with SparkoCam all of these can be accomplished in few clicks. SparkoCam creates a virtual web camera transmitting to any compatible application everything happening at your desktop in real-time. To create such a camera, please follow the below steps. Run SparkoCam and switch to the Device tab. You see, the program can work with multiple sources including conventional web cameras, photo cameras, specified video files or the desktop of your system, and stream the corresponding footage as a virtual web camera output. We need the desktop, so activate the Desktop section. 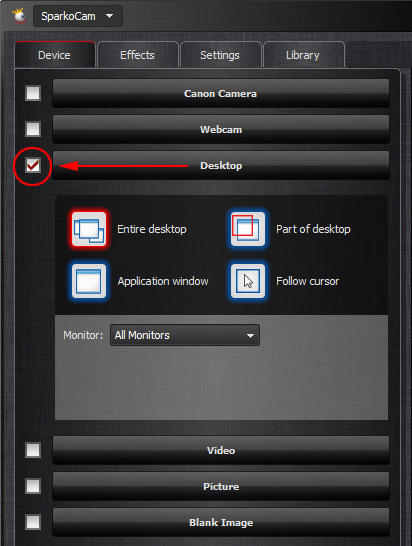 You can broadcast the entire contents of your desktop, a part of it, a specified window or make the camera follow the mouse cursor. Depending on the purpose of your stream, you might prefer different options. For instance, presentations require full screen capture, while how-to videos are probably better with Follow cursor option. Each variant has certain adjustments. The Entire desktop option allows you to stream contents of a given monitor only, or the entire multi-monitor desktop. Application window desktop streaming option apparently requires you to specify a window with the Pick button. If you chose the Follow cursor option, you can adjust the size of the visible area around the cursor. If you chose Part of desktop it is possible to define the capture area. Note that streaming of your desktop contents already started in the preview window. 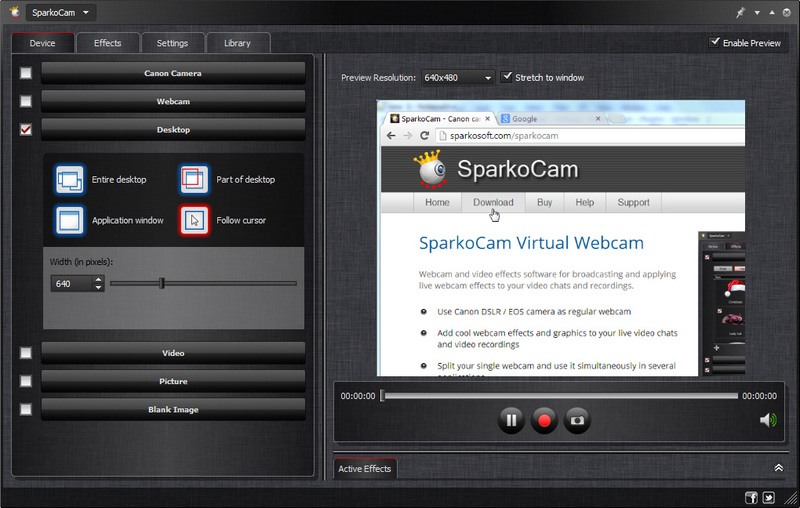 Now you can specify SparkoCam virtual camera in any application to begin broadcasting your desktop contents! Aside from streaming your desktop video directly, you can also apply various effects, add animated objects, transform or distort the picture or even use green screening to change the background of the footage.